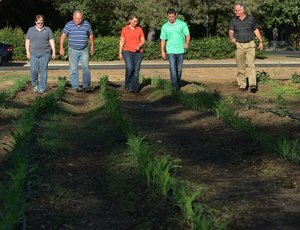 The garden project was featured in the Modesto Bee. A portion of the story appears below. Click here to read the complete article. MODESTO — The empty lot seemed so easy to tame. Gather a few neighbors, plant a few seeds and reap the rewards of a community garden. “The idea came through a conversation with my neighbor,” said Ryan Richards. But Richards and friends John Hickerson and Stephanie Edge discovered that having a vision is easy — implementing it takes initiative and know-how. Because this was Modesto-owned property, there were city requirements to navigate, donations to solicit for startup costs and, of course, the management, maintenance and participation of the garden itself. “I brought the idea to my church community at La Loma Brethren and got backing from a group interested in investing in our local neighborhood,” said Richards, 27, a teacher. The approximately 70-by-100-foot plot on Encina Avenue, down the street from La Loma Junior High School, had been an eyesore for years, he said. The group began discussions with the city in January and started planning for the garden in March. The group has provisional approval, said Julie Hannon, with Modesto Parks, Recreation and Neighborhoods, and must follow zoning laws. It must avoid blight and be aware of property boundaries.